Box Text: Always come back for seconds. Synchronize yourunits to cast Song Magic! Interact with Reyvateils to unlock new skills! The more you interact, the more powerful Song Magic you get! 07-25-2016 agozer Box Text Always come back for seconds. Synchronity Time Battle Synchronize yourunits to cast Song Magic! Virtual Dive World Interact with Reyvateils to unlock new skills! Song Magic The more you interact, the more powerful Song Magic you get! This is a list of VGCollect users who have Ar tonelico II: Melody of Metafalica in their Collection. This is a list of VGCollect users who have Ar tonelico II: Melody of Metafalica in their Sell List. 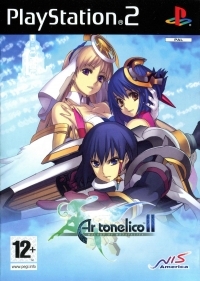 This is a list of VGCollect users who have Ar tonelico II: Melody of Metafalica in their Wish List.